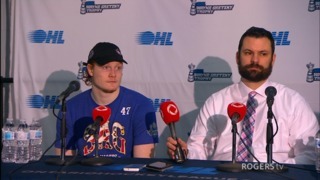 Oshawa, ON – Pyotr Kochetkov stopped all 23 shots he faced and Russia had goals from four different players, blanking the OHL for just the second time in event history in a 4-0 victory at the Tribute Communities Centre in Oshawa. Alexander Romanov, Pavel Shen, Alexander Yaremchuk and Kirill Slepets provided Russian goals as they outshot the OHL 28-23, breaking a stretch of 14 straight games being outdone on the shot clock that spans back to 2011. 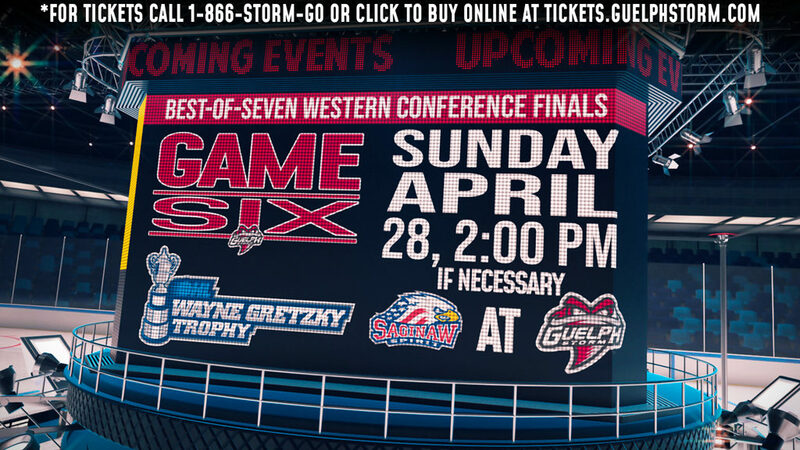 The series moves east to the QMJHL tied 6-6 in points for Games 5 and 6 with Russia carrying the momentum. 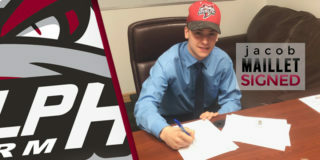 A second round pick of the Montreal Canadiens this past summer, Romanov put Russia on the board inside the opening minute of action, entering the OHL zone to send a wrister on goal that found it’s way past Hunter Jones (Peterborough Petes). Jones would come through late in the frame however, turning away Russia’s Kirill Slepets on a breakaway chance in alone. The Russians extended their lead before the horn as captain and Boston Bruins prospect Pavel Shen cleaned up garbage in the slot with 52 seconds remaining. 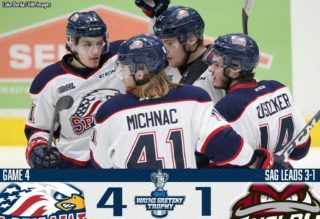 Defenceman Saveliy Olshansky sent a puck goalward that caromed off an OHL body, inspiring a rebound off the pad of Jones as Shen was on the doorstep for his third of the series. A back-and-forth second period saw the OHL send 10 shots the way of Kochetkov who was up to the task to keep the shutout intact. Jones also provided key saves to keep the OHL within two, kicking out the pad on Shen from close quarters inside the final minute of play. After the OHL seemed to gain some traction in the second, Russia wrestled back control of the game in the third as Alexander Yaremchuk struck on the power play 7:06 into the period. Kirill Slepets would finish-off a second effort after Jones turned away Artyom Galimov with a quality save, putting the Russians in full control up 4-0 with seven minutes left to play. All @russiahockey_en in Oshawa as they take a 4-0 shutout win in Game 4 of @CIBC #CANvsRUS. 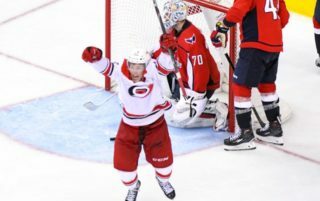 Russia’s Stepan Starkov stretched his point streak to four games with a pair of assists while Olshansky and Galimov joined him with a pair of helpers each. Kochetkov’s shutout is Russia’s first against the OHL since 2014 when Igor Shestyorkin stopped all 35 shots he faced in a 4-0 victory in Peterborough. The OHL wraps up its 2018 leg of the series with an all-time record of 25-6-1 as Jones made 24 saves in the loss. For the second straight year the CIBC Canada Russia Series heads to the QMJHL tied at six points apiece. 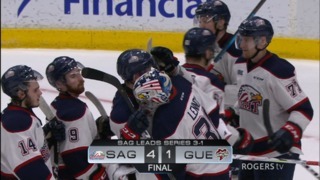 Be sure to catch a pivotal Game 5 on Tuesday night in Sherbrooke, QC live from coast-to-coast on Sportsnet and TVA Sports when the puck drops at 7 ET/4 PT.